NOTE: These are simplified flightsim procedures! Not to be used IRL in any circumstances! An airport that covers all sorts of flying! Bournemouth is home to a busy general aviation centre, as well as Cobham Aviation (defense training, medical services) and a medium sized passenger terminal that mainly serves destinations in Spain. Thanks for flying with us today, here's a rough guide to approach, departure and ground procedures at EGHH. As Bournemouth is quite a small airport nearby a VERY busy bit of airspace, I'll only really take control of aircraft within about 40 miles of the airport. I'll give you radar flight monitoring further out though, if Gatwick EGKK isn't active. The preferential runway is 26. Be aware of heavy restrictions (including high altitudes) along the coast to the south west of the airport due to artillery training, and to the north due to RAF training. Check out the large maps ENR 6.5.1.1 and 6.5.1.2 here that show the danger areas and their active times and altitudes, as well as if you're going to get t-boned by an F-15 at some point. All radar vectors, STARs and SIDs should avoid these areas, but don't come crying to me if you get blown up. 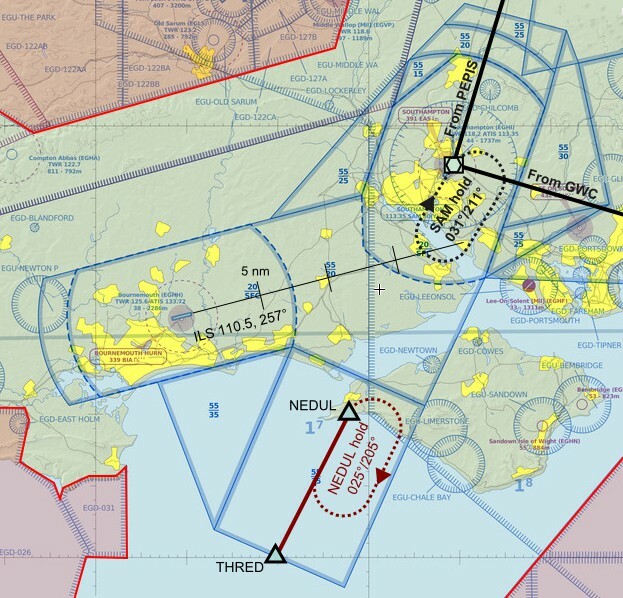 That said, there's some lovely views to be had on VFR along the "Jurassic" coast west towards Exeter (EGTE), or maybe while exploring the Isle of Wight, originally the home of the STOL stalwart, the Britten-Norman Islander. Fancy a STOL challenge? Head west towards the promontory Isle of Portland; on the narrow causeway between Portland and the mainland (Weymouth) there's a very short helicopter runway for you to try landing on! Circuit height: 1500ft QNH, 1200ft QNH for prop aircraft lighter than 5700kg (Maximum Takeoff Weight Authorised). Fly a standard left-hand pattern. Please avoid overflying built up areas, especially Bournemouth town centre, where a tethered sight-seeing balloon may represent a low-flying hazard. As a result, please try to avoid overhead joins from the South, a base-leg join from over Hengistbury Head would be preferable. Departures: On runway 26, as with the SIDs, fly heading 270° immediately after take-off, to DME 3nm. Then commence own navigation or pattern turns. Speed Limit Points (SLP): 250 knots or below at PEPIS fix (SAM radial 016° 15nm) or GWC (Goodwood) VOR. Expect 5000ft by SAM VOR. HOLD (only if necessary) = SAM, inbound 031°, turn right, outbound 211°. After SAM VOR, expect radar vectors. Speed Limit Point (SLP): 250 knots or below at THRED fix. Expect 5000ft by NEDUL fix. HOLD (only if necessary) = NEDUL, inbound 025°, turn right, outbound 205°. After NEDUL fix, expect radar vectors. From the west, head to BIA NDB 339 kHz, then expect radar vectors. Maintain 200 knots or less by BIA NDB. Expect 3000ft by BIA NDB. If active runway is 08, expect vectors direct for ILS, rather than going to BIA NDB. HOLD (only if necessary) = BIA, inbound 077°, turn left, outbound 257°. After take-off, fly heading 270°to 3nm DME. Southbound: Turn LEFT, fly direct to THRED, then along Q41. North/East/Southwest: Turn RIGHT, fly direct to SAM, then follow your desired airway. Westbound: Dunno really, just try not to annoy the MOD too much. There's not an awful lot to do that way, America is via Greenland, remember? On landing runway 26, exit to the left for the passenger terminal and private jet ramp, exit to the right for general aviation and Cobham Aviation. See the NATS ground chart for a map.